In general, Soul of Somanya jewelry is, quite literally, tribal African jewelry. The young adults who create it are members of the Krobo tribe, and the beautiful recycled glass beads they use in their creations are a traditional art form that has been handed down through generations of Krobo tribesmen and, more recently, tribeswomen. Our Soul of Somanya jewelry artisans also incorporate wonderful, intricate beads made of copper, brass and sterling wire, most of which they make themselves. All proceeds from sales go directly back into the project coffers so that we can keep these talented young Krobo jewelry artisans working at a living wage. We prefer to list only those items that are actually made by African hands. However, due to the extraordinary challenges and expenses involved in trans-Atlantic shipping, there are times when we call upon our wonderful volunteers here in the U.S. to assemble jewelry from the components made in Ghana, rather than making you wait weeks--or even months--for your order. Melody and Bernard also help to design and produce jewelry when needed. Either way, all of the proceeds go to fund the project. Soul of Somanya is dedicated to providing dependable jobs at a living wage, and these contributions by our volunteers help us to continue doing that. However, if you want to be sure that your item was produced by one of our Ghanaian artisans, no problem. Just ask. We will be happy to tell you, and to let you know how long it will be if we need to order one just like it from the Soul of Somanya staff in Ghana. If you opt to buy a product with copper or brass findings or ornaments, you will be making an important contribution to the sustainability of the Soul of Somanya project, since these metals can be obtained in Ghana. Keep in mind that both copper and brass will oxidize, darkening and becoming less shiny over time if they are not polished on a regular basis. They also react with some people's skin, particularly where perspiration is likely to occur (i.e. the back of the neck). When this happens, the metal can leave a dark mark, which washes off easily. Many people believe that, in the case of copper, the reaction is an indication of a PH imbalance, and that wearing copper helps to correct that imbalance. 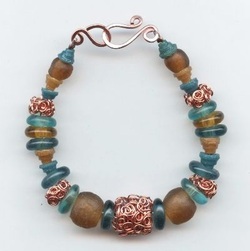 Many more swear that wearing copper is good for arthritis. In any case, we do offer many of our products in sterling silver or silver-fill for those who prefer those metals. Particular bead designs are not always available in Kroboland on a given day, or even in a given month. Consequently, there may be variations in the beads used in our products. We promise to come as close as possible in both color and spirit to the originals that are pictured on our shopping pages. Should the difference be substantial in any given case, we will contact you to see how you would like us to proceed.